I first made this soup this summer when Jonny & I were camping. We only had the ingredients, a pan and a sharp knife, so the traditional blended version of carrot & coriander soup wasn’t an option. However there’s something so clean and simple about this rustic version, and we both loved it. Do give it go next time you’re about to plunge your stick blender into your pan. I used a beef Oxo cube as I was after a deep rich soup base, so I didn’t add any extra salt. If you’re making it with some home made stock (chicken is perfect and super nourishing) taste and season the soup accordingly. 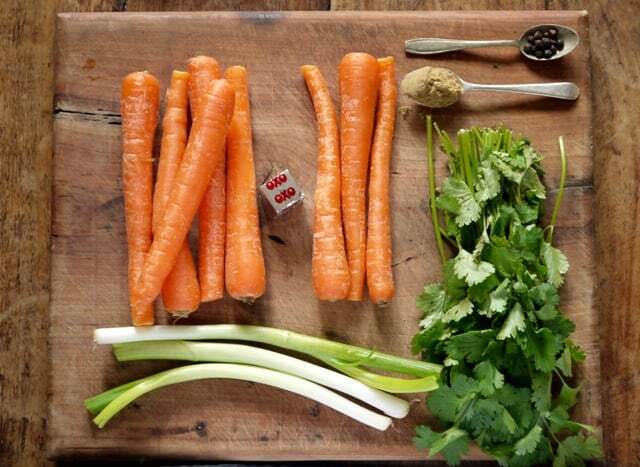 Add the carrots, stock/water & stock cube to a pan. Bring to the boil, then simmer the carrots for around 10 minutes. Add the ground coriander and pepper, then taste and season with salt if necessary. 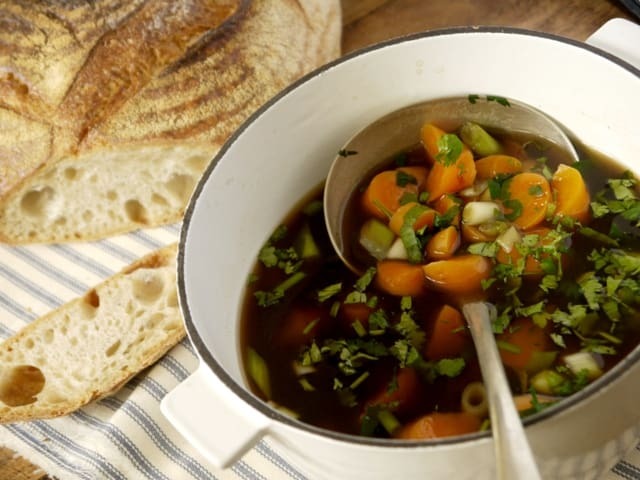 When the carrots are cooked just how you like them (I prefer a slight bit of bite left in them), take off the heat, stir through the fresh coriander and spring onions then serve with some yummy bread on the side. Me too GG, and you’re right soup when camping is just perfect! Yum Janie! I have carrots and coriander in the garden, so this is one dish I will definitely try! Thanks so much for sharing your recipe. I am one for getting the blender out as soon as I make soup. I guess I am gonna hold back the next time. Love the first photo.